Anyone who wants the full results of their training, should understand and accept that nutrition is the foundation for everything you do in the name of athletic growth & development. 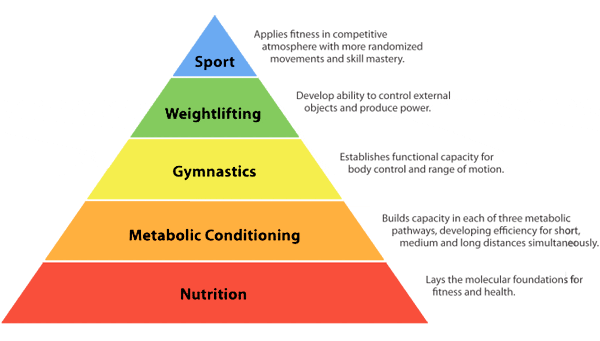 CrossFit's hierarchy of development supports the idea that nutrition is the building block from which we must build on top of if we are to succeed in our chosen sport. I'm sure you've heard the aphorism "you can't out-train a bad diet", or "abs are made in the kitchen." Trainers & coaches may disagree on the types of diet and programming you should follow, but the majority will agree that 80% of your results come directly from your eating habits. Nutrition can seem complex and overwhelming but it doesn't have to be. If you follow these simple rules you can easily get a handle on making sense of what your body needs in order to maximize your performance. To put it simply, food is fuel. Would you get in a car without a gas gage and decide to drive 100 miles? Just like a car think of your body as a machine. You can build it to be strong & durable and develop all the components necessary for your sport, like speed, strength, power and agility. With all these components, you have the potential to be great, but potential requires action and action demands energy. If you don't give your body the right kind, or a sufficient amount of fuel, you are compromising your ability to perform at your best. Aimless eating will get you nowhere. At the very least you should know how many calories you need per day to support your training, but for optimal results set and know your basic macronutrient intake. Get help from a nutritionist or personal trainer if you're not sure where to start. We all know that getting enough protein is important for our health. Protein helps regulate our hormones and blood sugar levels, it keeps us feeling full and satisfied and it promotes growth & repair in the body. For athletes, protein is particularly important because it forms the building blocks of muscles and can help prevent muscle loss when the body is in a catabolic state from training. Research has shown that an even distribution of protein consumed throughout the day is most beneficial in muscle protein synthesis. Good news for those of you who have a hard time downing a protein shake 30 minutes post-workout! Don't stress out too much about nutrient timing. Just make an effort to spread your protein evenly throughout the day, particularly at breakfast where foods are commonly higher in carbohydrates and fats, like toast & cereals. Select foods from this list of delicious high-protein foods. Carbohydrates have gotten a bad rap in recent years. Vilified for being the cause of various risk factors known collectively as metabolic syndrome, in truth, carbohydrates alone are not bad for you. It's the excessive consumption of highly processed and sugary carbohydrates together with a lack of physical activity that people should be wary of when trying to avoid weight gain and metabolic syndrome. Our bodies love carbohydrates! It's the preferred and most efficient source of fuel for energy. Not only do carbohydrates provide you with energy during workouts, but they are protein sparing, allowing your amino acids to get to work building & repairing muscle. If you want your performance to improve, you should eat a sufficient amount of complex carbohydrates throughout the day. About 40% of your total calorie intake is usually a good starting point, but depending on your training you will likely need more. Give yourself 2 to 4 weeks to try it out and then make small incremental adjustments as needed to meet your energy and performance needs. Not all that long ago we were told that fats made us fat and we should reduce our consumption with low-fat dairy and lean proteins. Thankfully we're a little wiser now and know that fats are essential to overall health. They regulate satiety & hormone function, manage energy metabolism and are essential for muscle gain. Fats are calorically dense containing 9 calories per gram so they help us feel full and also slow digestion. For this reason, you'll want to space your fats out throughout the day and keep them relatively low before and post workout so that your body can absorb and utilize your carbohydrates more effectively. Around 0.5g per pound of bodyweight or 30% of your total calories is a good jumping off point to establish your daily needs. Be sure to include fats from a variety of sources such as avocado, olive oil, nuts & nut butters and fish. Any athlete knows that a great workout doesn’t begin with a dynamic warm-up. The process starts with your pre-workout meal. This is an important first step to getting your body right so it can perform at optimal levels. With all that time and hard work put in at the gym or training, it would make sense to think that this is where your body is built. Well, that's not strictly how it works. You actually break muscles down during a workout. Post workout, muscles are primed to soak up nutrients so they can repair and rebuild themselves stronger and leaner. Getting adequate rest and refueling within a 2-3 hour window post workout should be an important part of your training. Water is necessary for all digestion and absorption functions. It is therefore key in maximizing the bioavailability of nutrients from the food we eat. Water contains electrolytes (substances in solution that conduct an electrical current) and is the medium for most chemical reactions in the body, especially metabolic reactions involved in energy production. Exercise performance can be impaired when an athlete is dehydrated by as little as 2% of body weight and losses in excess of 5% of body weight can decrease work capacity by about 30%. The bottom line, dehydration leads to a decrease in performance and nutrient uptake. According to the Institute of Medicine Food and Nutrition Board, most adult men and women need somewhere between 64 and 128 ounces a day. To ensure you're meeting your minimum daily water needs, take your bodyweight in pounds and divide in half. For every 30 minutes that you work out add 12 ounces to your daily total. With convenience foods being so easily accessible, mindless eating is an easy habit to pick up. In various studies about weight loss, research has shown that keeping a food journal can double someone's results. This is attributed to the fact that a food journal helps bring awareness to the quantity and quality of food that you're consuming. Recording your food also helps to keep you more accountable, especially if you share it with someone else to see too. From the perspective of an athlete whilst weight loss might not be your goal, recording your food will help to keep you consistent and it will also help you notice what types of food work well before, during and after training. Make sure you keep track of your performance and include notes on your energy levels as part of your journal. From the perspective of an athlete whilst weight loss might not be your goal, recording your food will help to keep you consistent with your diet and it will also help you notice what types of food work well before, during and after training. Make sure you keep track of your performance and include notes on your energy levels as part of your journal to really maximize the benefit of your self-study. Be consistent but learn to be flexible with your diet. If you eat the right kinds of foods 90% of the time then you are going to be successful and achieve the desired results. Use the other 10% to explore new foods or enjoy old classics that you love. Being too strict with your diet or depriving yourself of foods you love will likely lead to binge eating, developing an unhealthy relationship with food and losing motivation to keep working towards your goals. Be smart and make your diet sustainable. "Eat meat and vegetables, nuts & seeds, some fruit, little starch no sugar." This is Crossfit's prescription for nutrition as set out by Coach Glassman. In essence, this is not too dissimilar from the Paleo prescription to nutrition. Their commonality is such that they direct people to eat real, whole foods and for good reason. Whole foods contain an abundance of micronutrients, phytochemicals, antioxidants, adaptogens and other vital compounds that your body understands how to synthesize effectively, unlike many supplements out there. If in doubt, just keep things simple and natural. Your body is intuitive and will start to tell you what you need more of if you listen to its cues. For maximal fitness and output you will need to be more precise, but following the above 10-step prescription will give you a great foundation to your sports nutrition. Dietary Guidelines for Americans 2015-2020, Eighth Edition, December 2015. Hollis, J. American Journal of Preventive Medicine, August 2008; vol 35. Jeukendrup, A. & Gleeson, M. (2010), Sports Nutrition: An Introduction to Energy Production and Performance, Champaign, IL, Human Kinetics. Kravitz, L., Water: The Science of Nature's Most Important Nutrient.